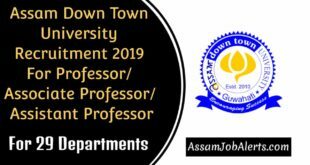 Applications from intending eligible candidates in prescribed Application Format appended herewith are invited on or before 28.02.2019 for filling up the following posts under Krishi Vigyan Kendras, Assam Agricultural University. Candidate must be an Indian Citizen as defined in Article 5 to 8 of the Constitution of India. Candidates already in Govt. service should apply through proper channel. Age as on 01.01.2019, the minimum age of the candidate shall be18 yearsand maximum age limit shall be 35 years. Age relaxation to SC/ST/OBC and PH candidates will be given as per government rules. Application fee of Rs. 300/- for General candidates and Rs. 150/- for SC/ST/PH candidates is to be deposited at Powerjyoti Account of the University lying with the State Bank of India, AAU, Jorhat Branch(A/c No. 33019714091). For payment, a challan copy shall be downloaded from the University website and fee paid challan copy may be enclosed along with the application form. A copy of challan is enclosed herewith. Self attested copies of all certificates/mark sheets in support of educational qualification, age, caste, Permanent Residence etc. Two copies of self attested recent passport size photographs. Self addressed envelope (size 23 cm X 10 cm) affixing postal stamp of Rs.6.00 (Rupees six) only. Physically disabled candidate will produce certificate issued by competent authority. Certificates of good character and conduct from two responsible persons known to the candidate (but not related to candidate) and indicating the name and address of the referees at the para 19 of the application form. The application without proper supporting documents shall summarily be rejected. Reservation shall be as per Government of Assam Rule. There may be a common written test for the posts under all 6 KVKs. The candidate should submit application for a post under 1(one) KVK only. No TA/DA will be admissible for attending in the written test. Canvassing directly or indirectly, influence in any form will be treated as disqualification of candidate. The last date of receipt of completed application forms is 28.02.2019(during office hours). No application will be entertained after the last date fixed. Mere possessing the requisite qualifications will not make a candidate eligible for the written test as the case may be. The final decision to call for the written /selection test shall rest with the University authority. Candidate may also collect application form and challan(download) copy from the Head/Senior Scientist of the concerned KVK.